Luis Cordova and Daniel Cordova made history on Sunday morning, becoming the first brothers to face one another in a R48 final. 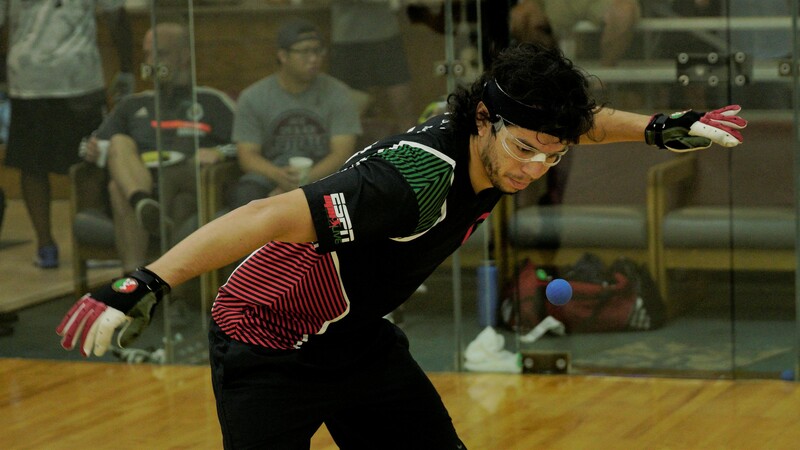 Lucho entered the final having survived two tiebreakers in his opening rounds, followed by a comprehensive two-game sweep against R48 #1 Killian Carroll in the semifinals. 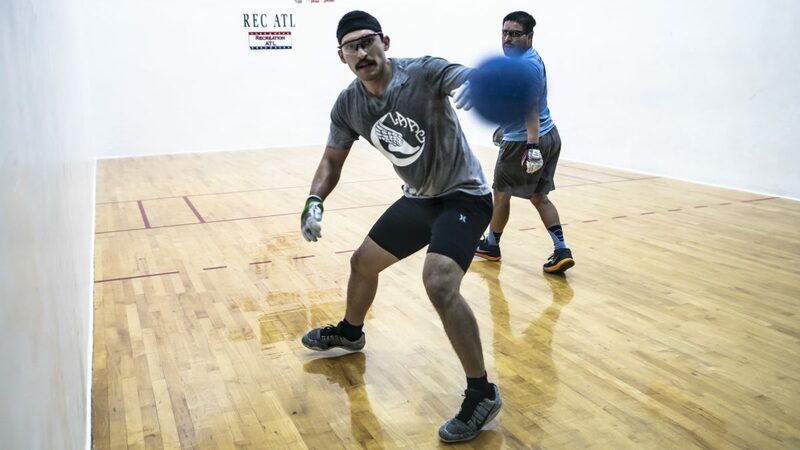 Danos also struggled in his opening rounds before playing his best handball against R48 #2 Sean Lenning in the semifinals, ousting “The Freak” in two games. Lucho raced to a 6-0 lead in game one against an anxious Danos, finding the bottom board consistently. A right hand Lucho error from the foot fault line handed Danos his first serve of the match, and Danos took advantage, quickly tying the score at seven. There would be very few short rallies for the remainder of the game, as the brothers averaged more than 18 shots per rally in a grueling 39-minute first game. Lucho served for the game at 14-9 but would need five innings before scoring the 15th point and taking a one-game lead. Danos took control in game two, playing with enthusiasm and decisiveness to take a 6-1 lead. Lucho chipped away, eventually cutting the deficit to one at 9-10. Danos found his right hand kill late in game two, forcing a third by scoring the last five points of the game. 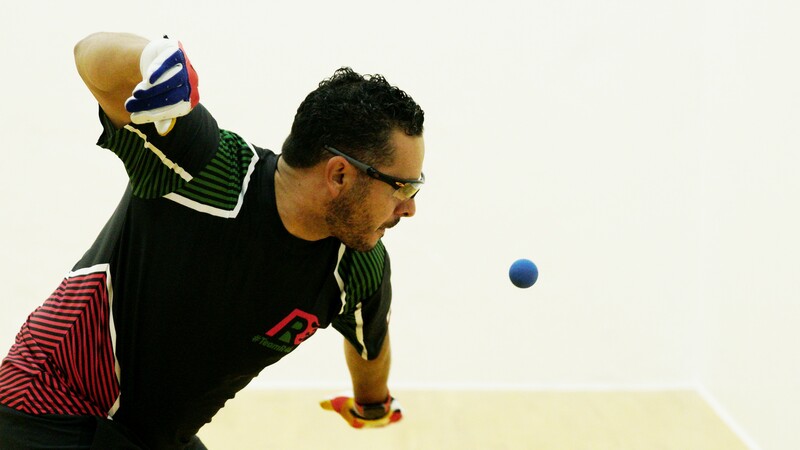 The tiebreaker featured some of the most exciting handball in R48 final history. Lucho and Danos lived up to the “Flying Cordova” moniker, with each extending rallies with incredible court coverage, highlighted by their famous dives. The lead went back and forth throughout the tiebreaker, with Danos clinging to a one-point lead at 10-9. A controversial bad bounce call at 10-9 in favor of Danos seemed to inspire Lucho, as Lucho scored five consecutive points with an ace serve, two right-handed kills, and several outstanding V pass shots. Just as in game one, Lucho struggled to score the final point, needing six service innings and 18 offensive opportunities before forcing a Danos error to win his first R48 title. 5th Place: Vic Perez was too strong for LAAC teammate Marcos Chavez in the 5th place final, clinching fifth place for the second consecutive event. 9th Place: All Ireland 40×20 champion Martin Mulkerrins bounced back from a disappointing first round loss to dominate the 9th place playoffs, defeating Shorty Ruiz, Loren Collado, and Max Langmack by a combined score of 75-23 to take ninth. 17th Place: John Wayne Cortez rebounded from a qualifier final collapse to earn his first ranking points on the R48, defeating Jonathan Chavez in the final. Luis Cordova entered Saturday’s quarterfinals on his home courts aiming to end a two-match losing streak against R48 #5 David Fink. 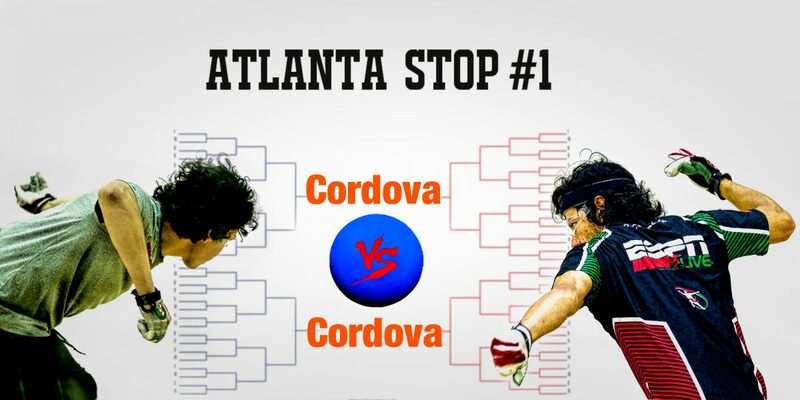 Cordova played was virtually flawless handball in game one, executing power serves to the right and bottom-board kills with both hands from the front court and back court to seize a one-game lead. Fink changed his approach in game two, playing more aggressively and controlling the front court to build a 13-5 lead. Cordova cut the deficit to two at 11-13, but Fink forced the tiebreaker with consecutive kills. Cordova raced to a 5-0 lead in game three, only to be caught at five. Cordova reestablished control at 5-5, scoring the 10 of the final 12 points of the match to setup a match with R48 #1 Killian Carroll in the semifinals. Cordova had won just one game against Carroll in four previous R48 matchups, but had entered the semifinals with confidence. “I’m going to get my serve going and just make my shots,” stated Lucho to Kara Mack before the match. Daniel Cordova defeated Emmett Peixoto for the first time in eight R48 matches in the quarterfinals to face a white hot Sean Lenning, who had outscored Martin Mulkerrins and Vic Perez by a combined 60-22 to reach the semifinals. Cordova would not be steamrolled by the Lenning train, as Danos took control of rallies with power hops and first strike offense. Danos hit 14 kills in game one, demonstrating a commitment to the fly kill and right-handed right corner kill. Game two was close throughout, with neither player able to score more than three consecutive points. Danos successfully prevented Lenning from scoring easy points, defending the Lenning serve and extending rallies. Danos surged at 11-10 in game two, quickly scoring the final four points of the match to advance to his second R48 final. Luis and Daniel will make history on Sunday, becoming the first brothers to face off in a R48 final. 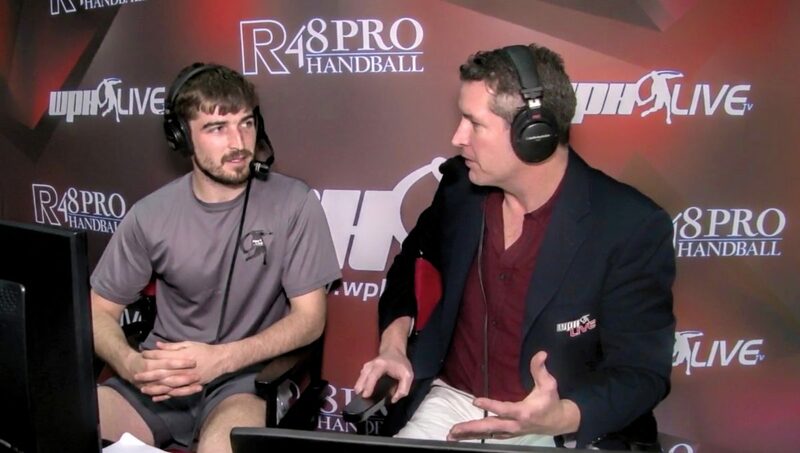 WPHLiveTV & ESPN3 Broadcast Today – Please Share!!! Watch Professional Handball from Atlanta, Georgia, from the Ron Cook Memorial Peachtree Open & WPH Race4Eight Stop #1 beginning at 10am Easter, Saturday, August 5th, 2018. You can watch via ESPN’s WatchESPN App by going to www.watchespn.com or by downloading the app to your smart device (Phone, TV, Gaming Console, Firestick, AppleTV, etc). The 2018 Race 4 Eight Atlanta kicked off the Race 4 Eight 8 season on Friday with third R48 event in Atlanta and 49th Race stop since the inception of the tour in 2011. 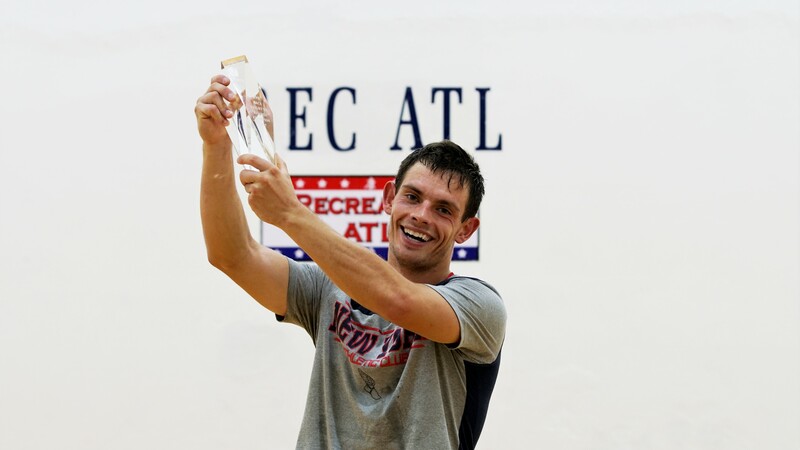 Killian Carroll entered Atlanta as the overwhelming R48 #1, having won nine of his last 11 R48 starts, in addition to the World Championships in August. Atlanta’s Flying Cordovas aimed to defend their home turf, while eight of the top 10 Race 4 Eight pros and a strong qualifier field will seek a strong start to their 2018/19 R48 seasons. Ryan Pesch kicked off his R48 season with a dominating qualifier victory against Matt Chu, while Martin Mulkerrins had no difficulty overcoming South Carolina’s Pete Fisher. Max Langmack continued to demonstrate why he is one of the sport’s brightest young stars, eliminating NorCal’s Pete Papathemetrios to advance to the main draw. Loren Collado survived a scare from Texas’ Jonathan Chavez, while Shorty Ruiz knocked out Ben Poe for the second consecutive year in Atlanta, running his qualifier streak to nine consecutive events. 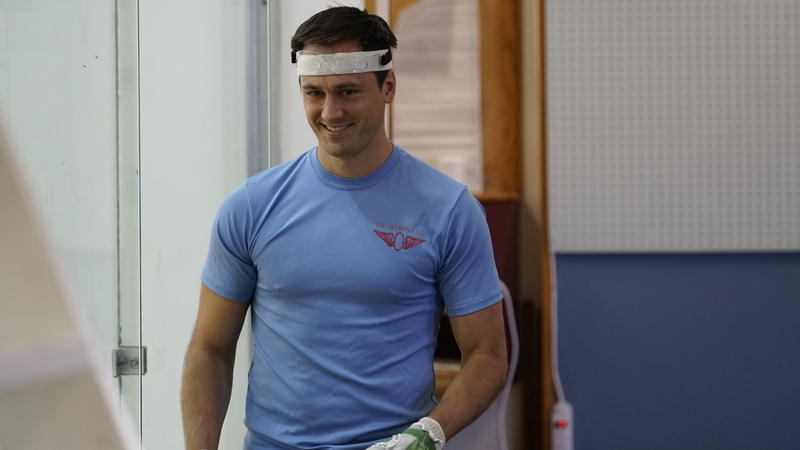 Sam Esser qualified for the first time, overcoming two-time R48 qualifier Nick Mattioni with a dominating 10-0 second half. Killian Carroll cruised in his first tournament match since clinching the World Championship in August against Leo Canales, Jr. Second-seeded Sean Lenning drew World Championship finalist Martin Mulkerrins and dominated the current All Ireland 40×20 champion, never allowing Mulkerrins into the match with a poised offensive attack. Third-seeded Daniel Cordova struggled in game one against first-time qualifier Sam Esser in game one, trailing 12-13 before scoring three consecutive points to win the game. Esser challenged Danos in the second game as well, before stalling at 13 once again. David Fink defeated Minnesota’s Ryan Pesch for the second consecutive year in the round of 16 in Atlanta, finding his serve-and-shoot game midway through the first game to take control of the match. 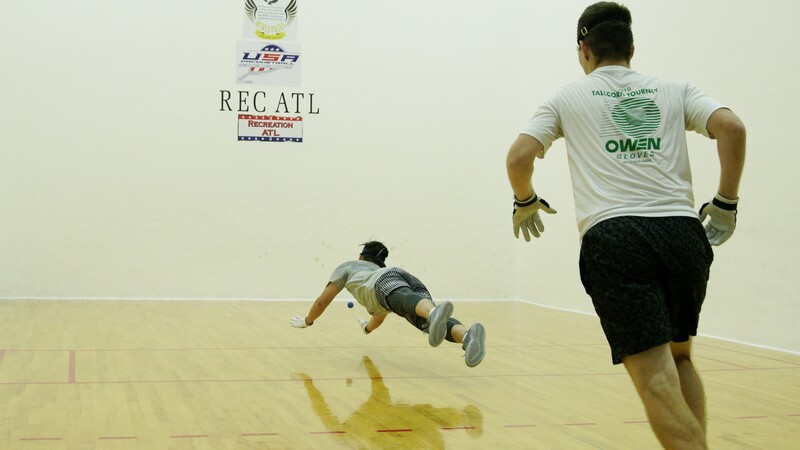 The match of the day pitted Atlanta’s Luis Cordova against rising star Max Langmack. Cordova took game one against an error-prone Langmack but the 6”9 Gentle Giant roared back in game two, erasing a 0-6 deficit to stun Cordova. Langmack mixed outrageous retrieves with flat roll outs to force a third. Cordova raced to a 7-0 lead in game three, only to see Langmack tie the game at seven. Langmack’s inexperience showed in the second half of the third game, as poor selection and costly errors cost the tallest pro in handball history a chance at his first main draw victory. 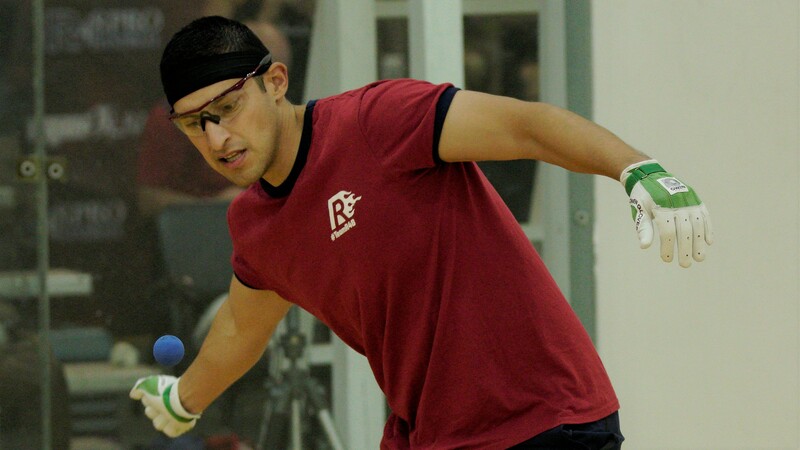 Olympic Club teammates Emmett Peixoto and Loren Collado played for a spot in Saturday’s quarterfinals, with the 15-time Olympic Club singles champion finding himself trailing 1-8 just five minutes into the first game. Peixoto played from behind throughout the game, ultimately tying the game at 12 and scoring the final three points to take a one-game lead. Collado controlled the action in game two, killing the ball with both hands to frustrate Peixoto en route to a game two blowout. Collado continued to be in control in game three, leading 4-1 before developing a debilitating cramp in his left leg. Collado soldiered on, but was unable to run or make the high quality shots to overcome the Rock. Vic Perez survived a scare from Tucson’s Shorty Ruiz, taking advantage of late game Ruiz errors to win in two games. Marcos Chavez and Peter Funchion met for the second time in 11 months, with Funchion dominating their first encounter in the 2017 Tucson Memorial qualifier. The 44-year old turned the tables on the Irishman nearly half his age, controlling the match from the outset and becoming the oldest player in R48 history to advance to a quarterfinal. Race 4 Eight pros David Fink and Marcos Chavez led an instructional clinic for the Missouri State Handball Team, teaching the V Pass, the Power Serve, and handball conditioning exercises. The nine college students ranged from novice to open level players, with each learning new skills to improve their handball games. 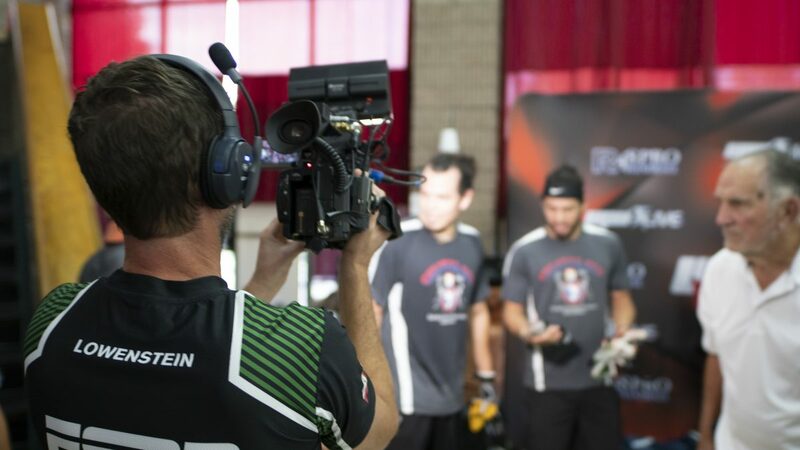 “The Race 4 Eight tour is an incredible platform to inspire young players and we’re thrilled to be able to provide opportunities for young players to share the court and learn skills from the best handball players in the world,” stated Fink. 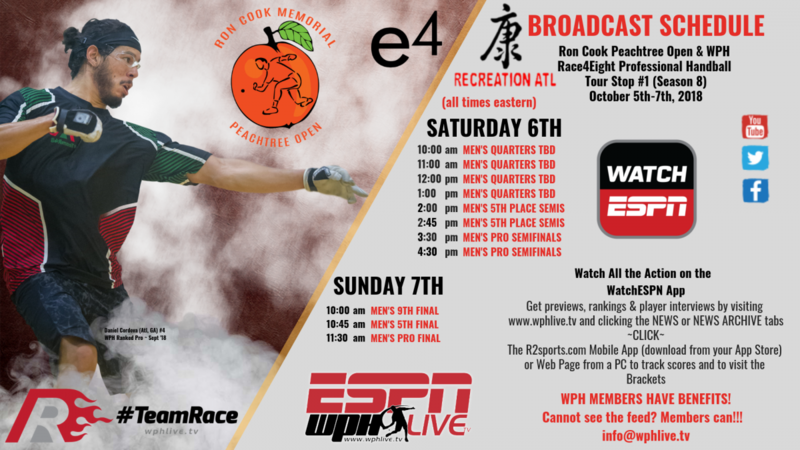 Watch the WPH Race4Eight Stop #1 from Atlanta, Georgia, as the Ron Cook Memorial/Peachtree Open is LIVE via Facebook-live Stream on Friday (Oct 5, 2018); meanwhile, ESPN and the WatchESPN App will be the platform to view all the action beginning Saturday (Aug 6) at 10am Eastern. You can watch handball on Saturday by going here: www.watchESPN.com.